Our school follows its own curriculum, built around the National Curriculum and incorporates the Global Dimension. The Foundation Stage follows the Early Years Foundation Stage Framework. We follow the National Curriculum in Mathematics, ensuring that we develop key Number objectives along with appropriate Shape, Space and Measures and Data Handling objectives. We follow our calculation policy which is on our website. English is essential to communicating with each other in all aspects of our everyday lives. Wherever possible we use it as a medium through which we teach our foundation subjects. We have a rich culture of reading. Each year we have visiting authors, reading competitions, bedtime story sessions and we invest in new reading material. We value the different elements of reading: developing phonics and phonemic awareness, encouraging children to read widely, reading to children, ensuring they comprehend what they are reading and most importantly finding a love of reading. Throughout the school we follow the ‘Come and See’ syllabus. A Catholic Primary Religious Education programme for Foundation and Key Stages 1 and 2. The school progresses through different topics every few weeks, with each year group studying a given element of it. Each topic is opened up through: Explore, Reveal and Respond. Every term the children also study a different world faith. Our curriculum aims to provide all children with a good understanding of key historical periods and the world around them today, along with the skills to use computers and technology in a rapidly changing world. Children have opportunities to develop an understanding of their own spirituality, Christianity and other world faiths. They also develop their creative skills through the Arts. A trip or visitor is planned by each teacher termly to further develop and enhance the children’s learning; this includes a residential trip in Year 6. The subject content for each year group has been allocated by our Curriculum development Leaders, in conjunction with the National Curriculum, and can be found on our website. The children’s curriculum is enriched by specialist teaching in the performing arts (drama and music), French (Key Stage 2) and sport. Entry point – The ‘wow’ moment at the start of the topic. It leads to further enquiry and creates a desire to know more and engage with the forthcoming unit. Knowledge Harvest – This session aims to gather information about what the children are sure they already know (green), think they know (blue) and questions they would like to find out (red). Mind maps are created using the colour coding; they can be scribed by adults, completed in small groups or individually. The information from these feeds into the medium term planning and the teaching of the topic. 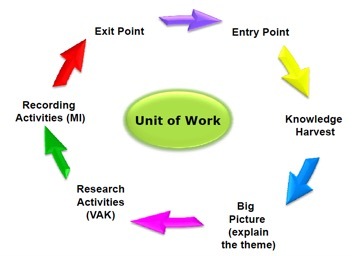 The Big Picture – This is a short step that outlines the unit to the children and explains the journey they will be going on. For example we may explain that children will start with 2 weeks learning about the pushes and pulls on racing cars before looking at remote control and toy cars after which they will design, build and evaluate their own, choose a race circuit in the world, look at climatic conditions and prepare for the race and exit point through racing their cars. Research Activities – within each subject block, e.g. science the children research/find out information. This is the point where Visual, Auditory and Kinaesthetic (VAK) learning styles are brought in to vary they style of research and suit different learning styles. Recording Activities – Once the research has been done the children record. This may be on paper, via role play, presentations, recordings etc. It is at this stage that Gardner’s 8 multiple Intelligences are considered (see below). This phase allows choice and challenge through which children hopefully break their own perceived ceilings. The cycles or research and recording activities continue until the end of the unit. Exit point – The final stage that brings together the learning from the unit, celebrates their new understanding and concludes it all. You may also want to revisit the knowledge harvest posters to see if they have answered their questions and can turn the blue thoughts green. Gardner was a Harvard graduate and a professor of Neurology. He believed that intelligence is not necessarily linked to IQ and that everybody has a particular area of intelligence. The blocking of subjects within thematic units has proven very successful. It enables deep and meaningful learning as a series of lessons are not fragmented over the course of several weeks. This means most afternoons in a week will be dedicated to one subject, before moving on to another subject in subsequent weeks within the same topic. Not all subjects will be covered in each topic. Some topics in the year will be art or DT heavy and not contain any history; another topic may be heavier on science and history and have very little art. We ensure that all subjects are weighted appropriately over the course of the year. The order of the subjects blocks within a topic are planned carefully for progression e.g. understanding the forces on a car, and the properties of materials before designing a car.